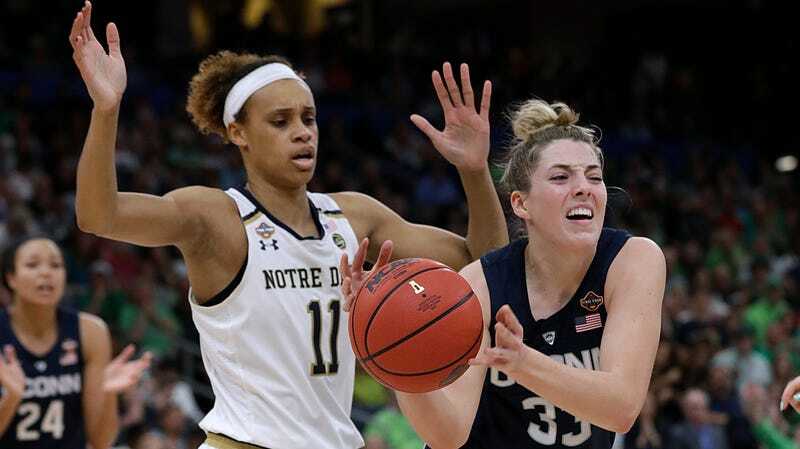 The last time UConn and Notre Dame faced off in the Final Four, Brianna Turner had to watch the absolutely batshit overtime game from the sidelines because she was recovering from a ruptured ACL. Yet despite not being on the floor that night, she still had a pretty damn good understanding of how to approach a game against this Huskies squad in this year’s rematch. Safe to say that she really stuck to that mindset on Friday. Her final stat line of the evening was 15 points, 15 rebounds and 5 blocks. In terms of scoring, she got to the line more than any of her teammates. In terms of rebounding, she led all players and really put some emphasis on Notre Dame’s size advantage. In terms of defense, well, it may have been the deciding factor to help her team take the win in a game that had 38 lead changes. Early on both teams looked like anything but the powerhouses they proved they could be in previous rounds. Notre Dame shot just 2-of-14 from three—with Arike Ogunbowale only scoring two points—and UConn went 1-for-11 from that same distance. But whatever issues the players were having on offense didn’t have any effect on how Turner performed on the defensive end. Three of her five blocks of the night came in the first two quarters and coach Muffet McGraw credited those swats for helping the team keep pace early on. Turner’s most important defensive stop came in the final minute of the fourth quarter. Though Huskies guard Christyn Williams got past Ogunbowale, Turner’s presence in the paint forced her to give up the ball to senior forward Napheesa Collier. Williams thought she was handing a scoring opportunity to her teammate, but, in reality, she ended up just telling Turner which player she should block. It’s worth noting that this defensive performance was still able to happen despite Turner getting two quick fouls early on in the game. She had to be benched for six minutes to avoid any more foul trouble, but those two calls would be the only two she’d pick up this game. You can argue all you want that Notre Dame was only able to win because Ogunbowale went supernova in the fourth quarter—scoring 14 of her 24 points then—or because Katie Lou Samuelson was the only Huskie who remembered how to score. But the fact of the matter is that without Turner, Notre Dame might have needed to rely on a few more lucky breaks to move on to the tournament final, especially against a team like UConn. Maybe that’s why McGraw couldn’t help but dance a happy jig in the background of Turner’s postgame interview.